A couple of weekends ago, I (finally) made my first visit to Assi Plaza in Duluth to pick up a few items. Taking advantage of the seafood bargains, I picked up (among other things) two pounds of head-on shrimp and a two pound bag of mussels. I knew exactly what I would prepare with part of my seafood bounty: moules frites, the quintessential Belgian bistro dish. Simple, delicious and perfect for a laid-back Saturday evening at home. 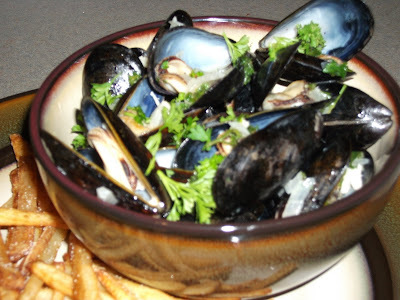 First, here's a recipe for moules marinière (sailor-style mussels). I found several variations of this recipe-this is the one I settled on. In a large pot, melt one stick of butter. When butter is melted and foaming, add the chopped shallots, garlic and wine. Cook over medium heat until shallots are translucent. Increase heat to medium high and bring the shallots/garlic/wine mixture to a boil. Add mussels to the pot and cover. Briefly shake the pot to settle the mussels into the broth. Cook until the mussels open up (about 2-3 minutes). 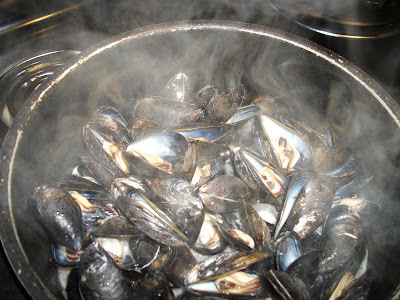 With a slotted spoon, remove mussels from the pot and into a large bowl and set aside. Reduce heat to simmer and add chopped parsley. Stir in a heaping tablespoon of crème frâiche and remove from heat. Arrange mussels in serving bowls. Spoon the broth over bowl of mussels and garnish with a bit of chopped parsley. Next up, the frites. I used two large Russet potatoes. Make sure your cut potatoes are nice and dry before frying. Blanche the potatoes in medium-hot oil. It should take less than a minute-you don't want the potatoes to brown (that will happen with the second "fry"). Remove from oil and drain on paper towels. Set aside for a few minutes. 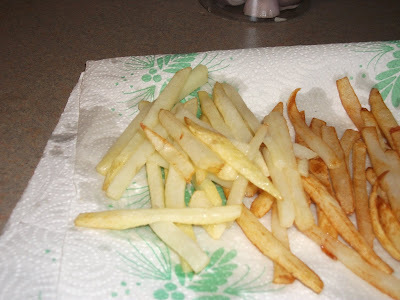 After the first fry, your frites should look like the ones on the left, not the ones on the right (they're a little too brown). When you're ready for the second "fry", reheat oil to about 375°F. Place the blanched potatoes in the hot oil and fry until golden brown. 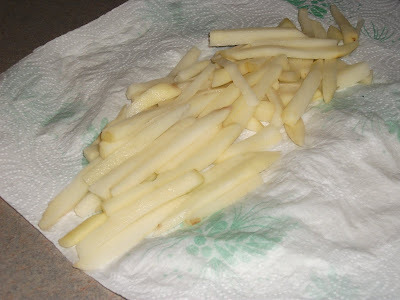 Remove from hot oil and drain on paper towels. 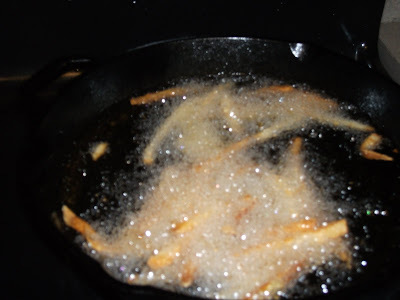 Season with salt not long after you remove frites from the hot oil. 1. Cut potatoes for frites and pat dry, make sure mussels are cleaned , chop parsley/shallots, mince garlic. 3. Start preparing the moules marinière. 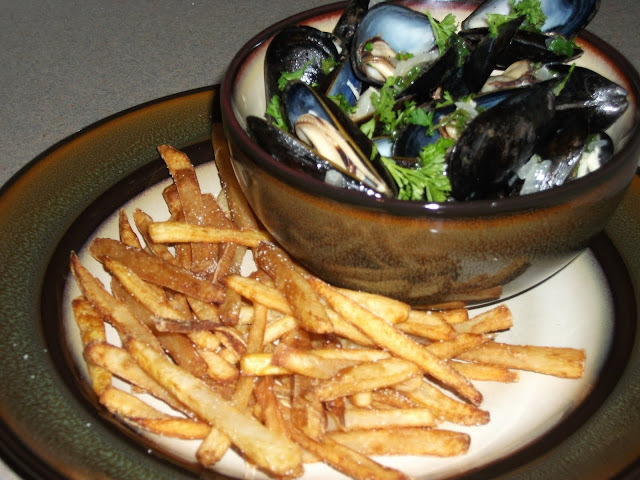 Just as you are about to add the mussels to the pot, reheat the oil for the second "fry" of the frites. 4. Remove cooked mussels from pot. When oil is hot, fry the potatoes a second time until golden brown. Drain on paper towels and season. You made your own fries too! I always end up making moules w/o frites because I'm too lazy to heat up the oil. Great! I love mussels and it had been a while since I'd had some. At $2 per 2 lb bag at Assi, I couldn't resist!